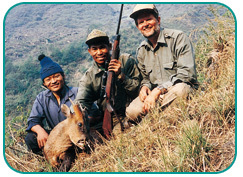 Nepal hunt has been closed for so many years dve to civil unrest. Now ? 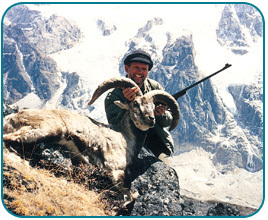 Game population surveys results have given confidence to the government for issuing some reopening hunting licenses on Blue sheep and Himalayan tahr. China, Tibet and Nepal are under the same “roof of the world”. But Nepal's side slope of the Himalaya Mountains faces south and gets more sunshine and rainfall. It used to be for hunting Blue Sheep and Tur, the hunter had to climb and hike several days. Now, modern transportation tools in NepleTur are related to ibex. The Himalayan tahr is one of three species of tahr. The others are Arabian tahrs of Oman and the Nilgiri of southern India. Himalayan tahrs have relatively short legs and small heads with large eyes and small pointed ears. Males are larger than females, they weigh between 79 and 198 pounds. They are 26-40 inches at the shoulder, and 4-5 ft long. Their hooves have a hard keratin rim surrounding a soft spongy convex pad. These hooves and their dewclaws make them excellent climbers. Both sexes have horns which curve up, back, and then in. They can grow up to 18 inches long and are bigger on males than on females. In the winter, the tahr has dense, reddish to dark brown woolly fur with a thick undercoat, which keeps it warm. The males will grow a long, shaggy mane around their neck and shoulders, which grows down to the upper parts of their legs. In the spring they lose much of their coat, and it becomes lighter in color. 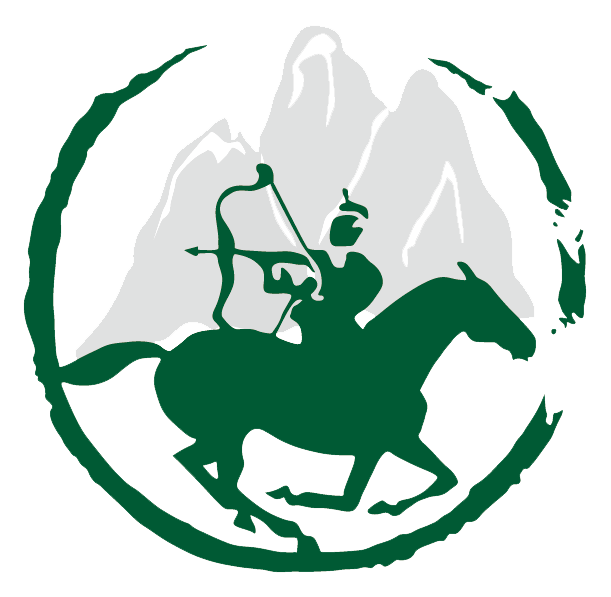 This includes a 19 day hunting package with trophy fees and permits for 1 Blue Sheep and 1 Himalayan Tahr and also pickup and drop off by Charter Helicopter, fly camp accommodations, 1x1 PH hunting guide, soft beverage. Not include:Hotel and meals in Kathmandu, , international airfare, local tour, and personal nature. 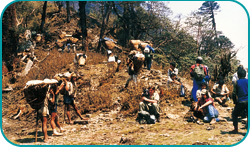 “As for the hunt, it took 3 days of walking from the nearest sizable village to reach our base camp. The village was at 8,500 feet; base camp was at 12,800 feet, and we hunted upward from there to as high as 15,200 feet (these are actual altimeter readings, not estimates). The circumstances of this hunt were extremely difficult. We walked seven to 10 miles each day. We walked about 60 miles total. That may not sound very far, but you must consider the altitude and the weather. up camp, and I missed a pretty nice blue sheep at 478 yards. No excuses. I simply failed to account for a 30- to 40-knot wind from my back, plus the 14,000 feet of elevation, and I shot slightly over the animal.